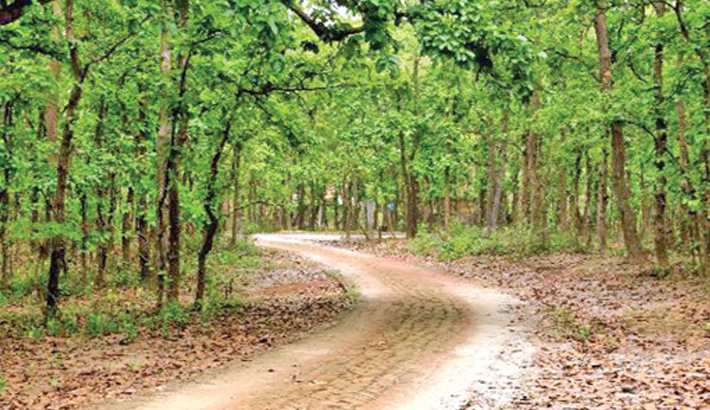 Different corporate houses, industrial units and influential persons have grabbed more than one-fifth of the reserved woodland in Gazipur district on the outskirts of capital Dhaka, according to an estimate of the Forest Department. Dhaka division of the department has prepared a list of the grabbers which shows that 11,372.39 acres out of the total of 52,737 acres of forest land in the district have fallen into their clutches. Forest officials say the unchecked grabbing is causing the lush green woodlands to shrink fast and making the country’s fight against climate change impact even more challenging. Mohammad Yousuf, divisional forest officer of Dhaka forest division, said a section of businesspeople and individuals have set up structures on the grabbed lands. He said industries, readymade garment factories and corporate houses based in the industrial hub of Gazipur are the main grabbers of forest land. Yousuf said the Forest Department conducted several drives and recovered parts of the forest land from the grabbers, but they are helpless to some of the grabbers. Dhaka forest division data show a total of 12,898.08 acres of forest land were grabbed but it managed to recover 1,516.62 acres. In 2016, the Parliamentary Standing Committee on Environment and Forest Ministry identified a total 155 business entities and individuals, who have grabbed 556.28 acres of land in different areas of Gazipur Sal [Shorea Robusta] forest. Of the grabbers, 97 are industrialists, corporate houses and influential persons. The list of the grabbers includes the names of Panas Auto-creation Ltd, McDonald Bangladesh Ltd, Health Care Pharmaceuticals Ltd, Wonderland Toys Ltd, BCDS (BRAC), Bently Sweater Industries Ltd, Givency Accessories Garments Ltd, ADI Aqua Pvt Ltd, Classic Fashion Ltd, One Denim/One Spinning Mills Ltd, Arizma Garments Ltd, Sharifbari Khamar (Silver Forest), Hologram Bangladesh Ltd, Epilion Style Ltd, Adi Agro Farm, Ax Pharmacia, Aristopharma, TDK Zipper Industries Ltd, SM Knitting Industries Ltd, BG Collection Ltd, Nur Poultry Complex, Bangladesh Maze Product, Ivince Tex Ltd, Titas Skinng Ltd, Bengal Garments Ltd, Mala Poultry Farm, Mazkat Poultry Farm, TS Transformer Ltd, National Feed Ltd, Modern Feed Ltd, Lithi Group, Paragon Poultry Ltd, Screen Graph, Gordon Steel Mills, Mosharof Composite Ltd, Pacline Ltd, Nishorgo Picnic Spot, Artisan Ceramic Industries Ltd, Sojoni Film City, BT Limited, Millennium Steel Mills Ltd, Queens Poultry Farm, Omoni Agro Complex, Dhaka Fisheries, Radium Accessories, Nirjona Apparels, Golam Kibria Fish Farm, Index Construction, NAZ Bangladesh, Shahba Yarn, ATI Ceramic, Givency Denims, Nestle Bangladesh, Green Tech Resort, Sattar Tex Mills, Nirmola Baroi, M/S Ahsan Composite, Zalal Textile Mills, Shipi Kunzo Picnic Spot, Shihab Jute Mills, Sohag Palli Spot, Somahar, Casenda Colours, Far East Company Ltd, Modina Tank, Aziz International, Hardy Textile, Niagra Textile, Haji Mills, Fare Trade Ltd, Pasha Mills, Coroni Composite Ltd, Shamsuddin Spinning Mills, Rahmat Textile Mills, Hidoxide Ltd, Chowdhury Monowar Uddin Siddiqi, Hanif Spinning Mills, NM Textile, Cocola Food Products, Levis Textile , MA Wahid Bricks, Wistoria Textile, Eco Mills Products, Paramount Textile, Great Wall Ceramic Industries, Solar Ceramics, Eco Cotton Mills, Bhawal Industries Ltd and Trade, Trade Management Corporation, Ontex Ltd, How Are You, Aronyo Kutir, Mita Textile, Meghna Composite, Jubaer Spinning Mill, The Sweater, RAK Ceramic, Rasua Spinning Mills, Ridisha Garments, Dulal Brothers Defense Group, Hongkong Shanghai Mangela Textile, Auto Spinning Mills, Monu Feeds Ltd, Golam Mahid Monsur, Mamun Proprietor H Power, Home Design Ltd, Akanda Garden, DM Agro Complex , Kunjo Bithi, Bnagladesh Building Cement Ltd, Alif Auto Bricks, Al-Nur Hatchery, Foysal and Fahad Bag Industries, China Bangla Packaging and Printing, Prime Pharmaceuticals, HS Agro Poultry, Rex Auto Bricks, Gonosashthya Pharmaceuticals, Shishu Palli Probash, Mag Hatchery, DBL Ltd, MOM Laundry Complex, Warbit Steel Building, Dana Group, Sun Power Ceramics, Khalil Group, Masuma Garments, Jesson Agrovet, Givency Group, Far Ceramics, Galaxy Ltd, Hua Thai Ceramics, Sultana Dyeing, Fu-Wang Groups Ltd, Chung-Fung Mills, Masuma Khatun Garments, Hotapara Garments, Sang Koang Apparels Ltd, Community Based Waste Management Project, Aranyok Banglo, Jahanara Begum and others, and Itemad Ud Doula. Dhaka divisional forest officer Mohammad Yousuf said the latest spate of forest land grabbing is continuing for the last one and a half years. He said they have filed complaints with the deputy commissioner of Gazipur for recovering forest land from the grasp of influential grabbers. He said recently they recovered 10 acres of land from Ha-meem Group in Sreepur, 6 acres of land from DBL Group and 7 acres of forest land from Green View Resort. Forests are shrinking in Bangladesh due to leasing out of forest lands to various organizations and illegal grabbing by a section unscrupulous people. A total of 158,031 acres of forest land has been leased out to different organizations and 268,265 acres of forest land are in the hands of the grabbers, according to Bangladesh Forest Department data. The country’s total forest area has shrunk by 65,000 hectors in the last 25 years. A total of 13,000 hectors of forest disappeared in the last five years, according to the report titled State of the Forest-2016 produced by the Food and Agriculture Organization of the United Nations. To protect environmental balance, a country needs 25 per cent forest land of its total area while Bangladesh has only 10.66 per cent including the leased out forest land. More than 65.8 per cent of the country’s forest is at risk of high destruction. Bangladesh has a total forest area of 6,368,859 acres of which 4,652,249 acres are under Forest Department, according to Bangladesh Forest Department.